The mobile app, which is TweetDeck’s first foray onto Android phones, supports multiple streams beyond Twitter, namely Facebook, Foursquare, and Google Buzz. (The desktop is also multi-stream, but the iPhone app only supports Twitter and Facebook). The biggest departure, though, is a blended stream that combines updates from all four services, color-coded with different backgrounds for each one. 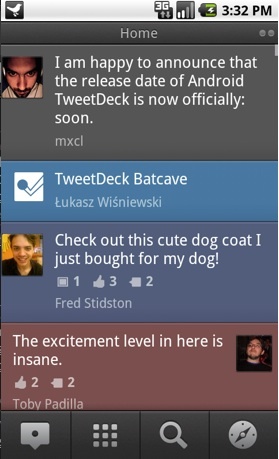 TweetDeck’s other apps maintain a separate column for each stream. The Android app supports columns as well, and if you have an existing TweetDeck account, it populates them with your existing preferences. 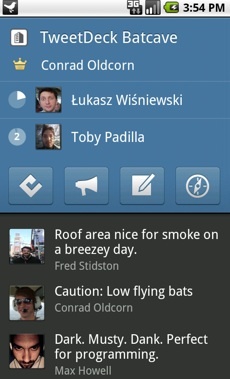 The app takes full advantage of the Foursquare API. In addition to being able to see where your friends are checking into Foursquare, TweetDeck acts as a full Foursquare client. You can check into a location, leave a shout or a tip, or see a location on a map. Each location has a detail view which shows you all your friends who checked in there recently and any messages they left. 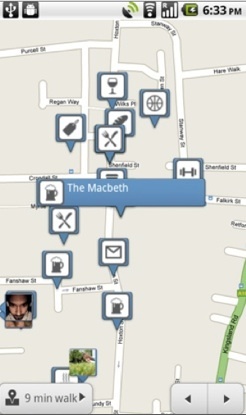 A general map view shows all nearby Foursquare venues and any geotagged Tweets. Friends who have check in nearby are also placed on the map. The app has a contacts page with quick links to each of your account profiles, and slots for the people you talk to the most. One thing it doesn’t have that is in the desktop app is user streams, which delivers Tweets as fast as they are produced without any limits or throttling. Apparently that feature kills the battery life on mobile. This is a beta, which means TweetDeck is still working on it. For instance, it doesn’t handle multiple Twitter accounts as smoothly as it should or video uploads. But these issues will be fixed in the near future. 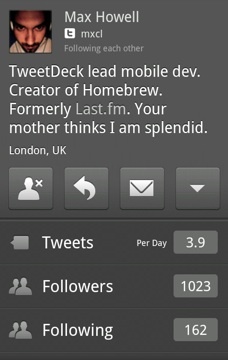 Another thing to note is that seems to be an older build of the Android beta floating around, which has even more bugs. Better to wait for the official beta release which should come tomorrow.